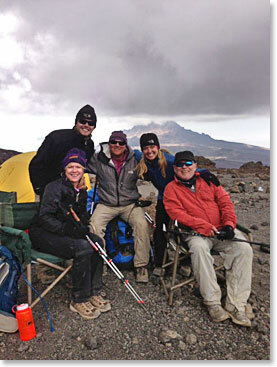 It the Thursday 29th of August and the Klimb for Kidz Team; the Sutterlin family has reached the Berg Adventures High Camp on Kilimanjaro 16,000 feet above sea level. The clouds have closed in and we have had basically good weather the entire trip and I think that is going to hold on for our summit day tomorrow. The family has been really tough, each member of this team has pushed hard and we had a relatively quick ascent rate on this climb and it has shown. Yesterday Colleen was showing signs of not being acclimatized to well but she responded well to her altitude meds and today she has been looking great all day. Today it was Landon’s turn but he took a turn for the better when he pushed past 15,000 feet. So we are going to keep an eye on each other and take an early dinner tonight. We are already snug in our sleeping bags waiting for dinner to be served! 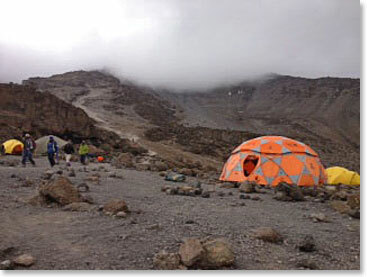 We will be waking up at 11:30 pm seeing how everybody feels and if things are good we will begin climbing slowly and make the attempt all the way to Uhuru peak. Wish us luck and we will keep you posted as we continue climbing tomorrow and hopefully from the top of Africa; Uhuru Peak on Kilimanjaro.